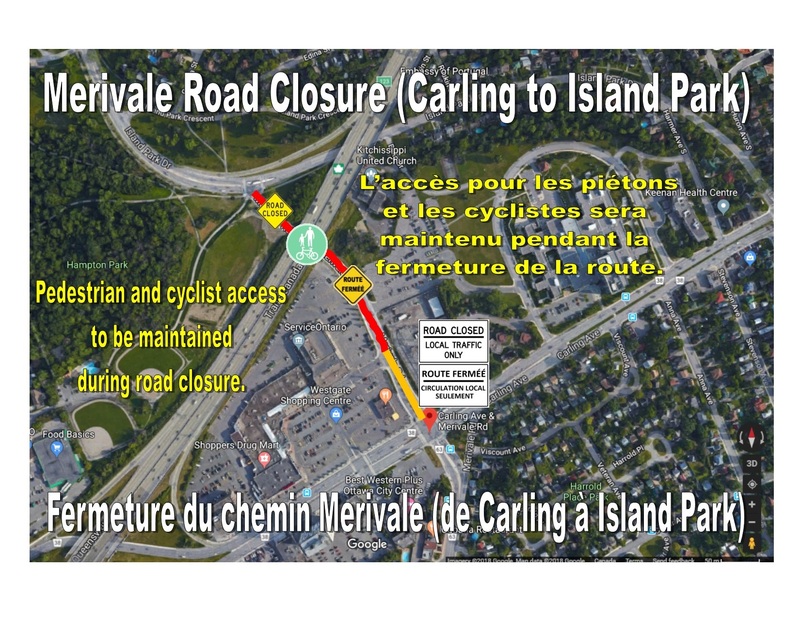 Ottawa – Starting Monday, August 13 at 6 am, Merivale Road will be closed in both directions for approximately ten weeks between Island Park Drive and Carling Avenue. The closure is required for public and worker safety reasons, as the Ministry of Transportation Ontario (MTO) completes construction to widen Highway 417 between Maitland Avenue and Island Park Drive. The work involves widening of the Merivale Road Bridge. Signed detours will be in place for the duration of the closure. The sidewalk on the east side of Merivale Road will remain accessible for pedestrians. Cyclists can follow the detour, or walk their bikes on the sidewalk. Local traffic can continue to access the Westgate Mall only via Merivale. OC Transpo routes 80 and 81 will continue to service Westgate Mall, and no bus stops will be impacted. For more updates on construction and roadwork activity across the city, or for information about traffic and travel planning, visit the City’s Traffic Report or follow the City’s traffic account on Twitter.